Seattle Solidarity (“SeaSol”) is a volunteer network of working people who believe in standing up for our rights. Our goal is to support our fellow workers’ strikes and struggles, build solidarity, and organize to deal with specific job, housing, and other problems caused by the greed of the rich and powerful. Join us! Let’s fight to win. Problems with your boss or landlord? Get in touch. SeaSol ended 2018 with a win as we forced an insurance broker to give one of their employees backpay after paying them less than minimum wage for two months. The worker received the check for almost $500 just before the holidays, which was double the money they had been underpaid, as outlined in Seattle’s minimum wage ordinance. The worker first came to us in September after they were fired in retaliation for bringing up their wages. We started our fight with a demand delivery in October attended by roughly 25 SeaSol members and supporters. When the deadline to pay up passed, we began postering the neighborhood and flyering passers-by. This escalated into a picket in November after which the boss claimed they wanted to pay up. But after dragging their feet and trying to tie unfair conditions to the check, we held a second picket in December. The worker got their check the next day. After months of targeting and harassment by the landlord, tenants from American Campus Communities (ACC) have organized an association and executed the first of many visible actions. 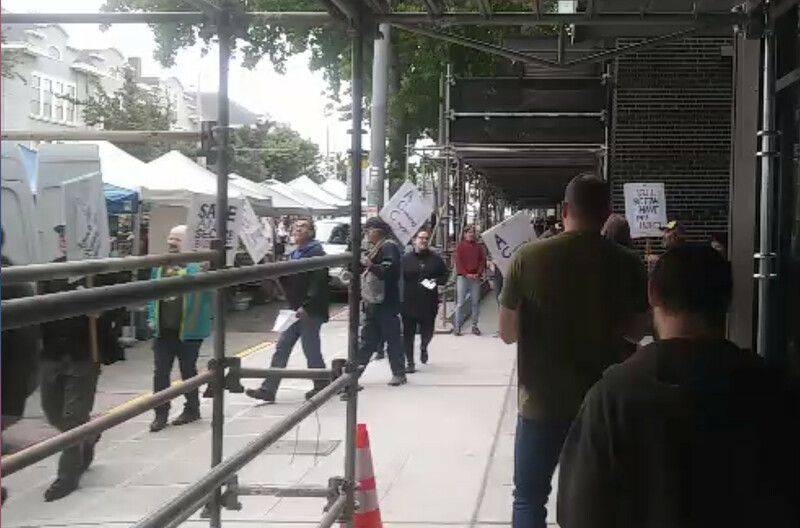 With help from SeaSol ACC tenants held an informational picket attended by 30 tenants and community supporters on Saturday, June 30th from 11 am to 1 pm in front of ACC’s flagship building Hub in the University District. Tenants from ACC first got in touch with SeaSol in April to seek help in their fight against their massive new landlord. Over the next few months we assisted tenants with door knocking, community outreach, and putting together their first association meeting earlier in June. American Campus Communities, Inc. is an Austin, Texas based publicly traded real estate investment trust (REIT) with an annual revenue of $796 million and 161 buildings over 68 campuses whose “primary business objectives are to . . . acquire and operate student housing communities”. ACC’s acquisition of Bridges@11th in October 2017 put the company’s dorm-style business model squarely in opposition to the single-family model at Bridges. ACC also purchased two more U-District buildings, TWELVE and Hub, in 2017, with ambitions to acquire ten times as many units should their Seattle market test succeed. In the company’s first year in the city, ACC tenants have faced non-compliance of contracts and law violations including forcible entry into units by employees, illegal evictions, fraudulent billing practices, and forged documents, among a multitude of other issues. Tenants who spoke out have been targeted with increased surveillance and have even had their mail withheld. SeaSol looks forward to supporting ACC Tenants in their struggle as they utilize a diversity of tactics to win their demands. As some active tenants work to tie ACC’s hands with the legal system, others will work to build a strong direct-action presence in the community. Workers at a new airport contractor recently found that they were facing a serious issue with their paystubs: employer-paid healthcare was being listed as part of their Gross Income. After raising the issue with management for several months and getting at first flat out rejection and later half-hearted promises, several workers got in touch with SeaSol. After a demand delivery to SeaTac management and the contractor’s on-site office, the issue has been resolved! In addition to potentially overtaxing them, the paystub error left the workers, most of whom are low-income, at huge risk of losing or being denied housing, childcare, and other services. Including employer-paid benefits as part of gross income made that number appear significantly larger, putting them above the threshold for many such services. When workers initially approached management, they were told nothing could be done and that it was an “IRS requirement.” This could easily be proven false by the fact that the previous contractor, in place just last year, had not had the same practice and there had been no changes in benefits. After continued pressure from workers over several months, management decided to give out a letter admitting that healthcare was not part of gross income. While this recognized the problem, it did nothing to solve it as agencies and service providers only take paystubs as proof of income. Shortly after workers, some of whom were already in touch with SeaSol from a previous fight, got in touch with us, the company started claiming it would look into fixing the issue, but gave no clear timeline or firm promises. Due to the urgency of the situation, we drafted a demand letter and began preparing for a direct action campaign. 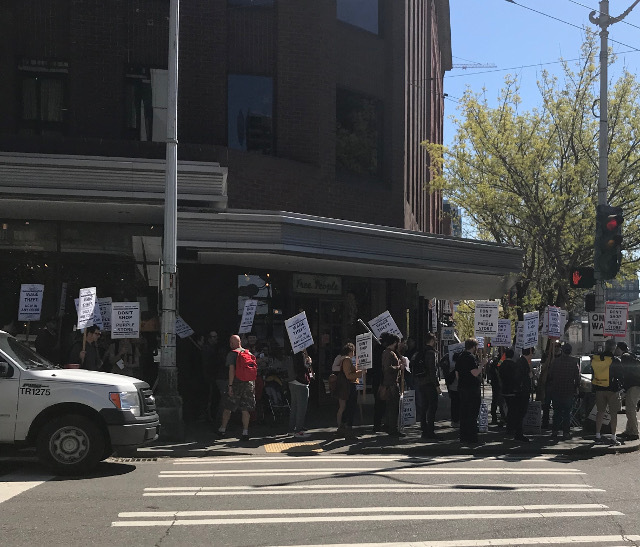 On April 17, about 20 SeaSol members and supporters joined family members of the workers in delivering the demand that the contractor cease including employer paid healthcare on paystubs. We delivered the demand first to the management of SeaTac, in order to bring pressure from above, and to the contractor’s local office. Emails were also sent to the company’s executives. We gave them until the next paycheck to comply or we would take direct action. The action was widely talked about by workers in following days. About a week-and-a-half later, all workers were called into a meeting. They were given the news, backed up in writing, that the May 4 paycheck and all further paychecks would no longer include the false gross income. In March 2018 SeaSol helped a family defeat an attempt by their landlords to evict them for having a second child. The property management company had established a clear pattern of targeting the family, and had denied a request to move to a larger unit only days before on false claims of damage to their unit. The family had moved to their current residence in Seatac, Washington in early 2016 while the wife was visibly pregnant with their second child. Throughout their two year tenancy, they had a nearly spotless tenancy record marred only by seemingly targeted warnings later in the period, one for simply hanging a rug out to try a single time on the balcony. During this time the landlord knew fully that they were technically over the unit occupancy limit of two per-bedroom plus one, and in fact had known since move-in. Several months prior to their eviction notice the family applied for a two-bedroom unit, both to come within the occupancy limit and to simply have more space for their family. When the site manager inspected the unit the family were told it was fine, and they even offered to pay for the minor wear-and-tear. They were therefore surprised when the notice arrived that they had failed the transfer inspection, citing damage that wasn’t real, and even more surprised when they were informed they would be evicted for having too many occupants, something the landlord had known and accepted for two years. The family then heard of SeaSol and expressed an eagerness to fight back. Due to the short timeframe we were working with and the risk of fighting your landlord as a single tenant, we decided on an unorthodox strategy for the fight. We sent letters to the property manager and the building owners asking them to reconsider the decision and come to the table, with the intention of pursuing a several-months long punishment fight were the family to be evicted. Perhaps motivated by SeaSol’s long record of fighting with workers and tenants, the property manager rescinded the eviction a mere two days after sending the emails and a day after the family had received notice for their now-canceled move-out inspection. We are thrilled that the family will be able to continue their tenancy. Over the course of the fight, though, a number of further issues have come to light. Stay tuned for more! Published by Lee, in Fight Update, Fight Update, Fight Update, Fight Update, Fight Update.